The Football Section can claim to be the oldest section in Nomad Sports Club, winning the Philippine National Championship in 1924. It is a very active section, one that is enjoyed by players and spectators alike. Competitive games are usually arranged for virtually every Sunday afternoon, with a 4:00 p.m. kick-off. 2003 is the second year where the Nomad's sports field has been used for every game in a newly formed metropolitan league of which Nomads participates. Matches are played during weekdays in the evenings and include such illustrious local sides as Army, Atteneo, French and others. International Six-a-Side Competition: This competition attracts teams from all over the world and has become a major attraction in the world of amateur soccer. Over thirty-two teams compete during two days of a November weekend. Teams not only arrive from all around Asia, but Europe and Australia. February and March are particularly busy. First there are two seven-a-side tournaments for veterans. The over 30s play for the Nomad's Cup while the over 40s compete for the Albie Roberts Cup. These competitions also attract teams from many parts of the world and, with the aging of South East Asian veteran players, are becoming increasingly popular. Also within March each year is the very popular Mini-World Cup. The many various nationalities, including Filipinos, who reside in the Philippines form themselves into national teams to compete in this exciting two-day, six-a-side competition. A Junior Mini-World Cup for the various school children is also played in March. This allows the children from local and international schools to compete in a six-a-side competition, in both the under 11s and under 14s. It is an exciting weekend where tomorrow's footballers display their talents. A new competition, only commenced last year is one based on the Mini-World Cup format, but is a Mini-European Cup, limited to those players from Europe. Its popularity is that it is held in July. 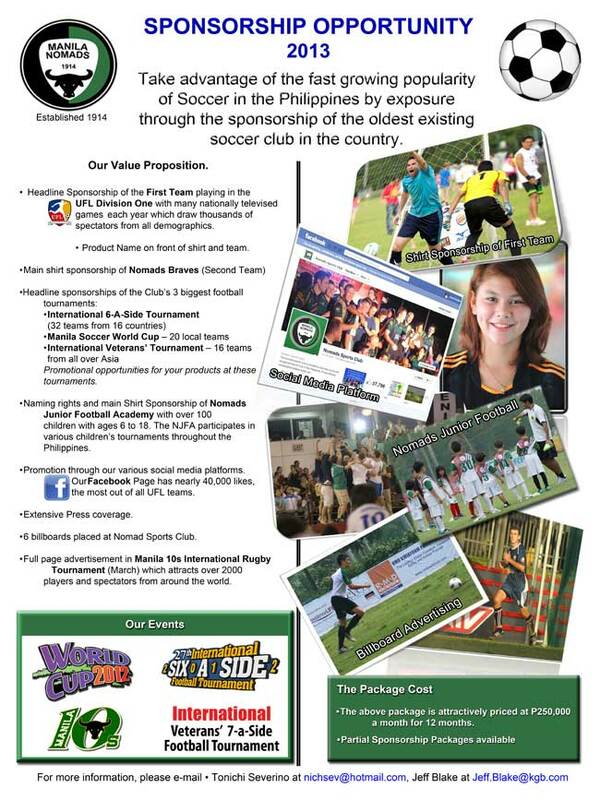 The proceeds from many of these competitions allow the soccer section to be able to tour once a year. Usually we enter a team in another clubs six-a-side. Although we have traveled to a number of destinations and enjoyed our tour very much, perhaps the hardest and most disastrous game was a surprise match against the national Vietnam team. In front of over 20,000 spectators, we lost.